Checklists are powerful tools that we all need to use. Earlier this year, I shared my Weekly Review checklist. In today’s article, I will explain how to build a checklist to improve your performance at work. Adding a checklist to your professional toolbox is one of the best ways to reliably improve the quality of your work. My approach to the checklist is influenced by Atul Gawande‘s excellent 2009 book “The Checklist Manifesto.” Gawande comes to the checklist from the world of surgery where mistakes cause lawsuits, injuries and death. 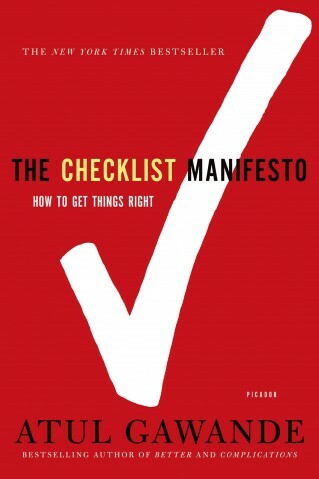 In reading his book and applying the ideas to my work, I became convinced of the value of checklists. As you read this post, you may be new to checklists. Given that reality, let’s cover why checklists are valuable. In Gawande’s view, there are two categories of problems we face in getting work done. For the sake of practicality, let’s set aside matters outside of our control. The first reason for failure is ignorance – we simply do not know what to do. The second reason is ineptitude – “making sure we apply the knowledge we have consistently and correctly” (pg 10). In medicine, engineering and many other professions, humanity has made great advances in solving ignorance. Unfortunately, ineptitude remains a serious problem. Despite the best training, certification programs, and specialization, highly capable professionals continue to make costly mistakes. Mistakes in medicine. “This is the reality of intensive care: at any point, we are as apt to harm as we are to heal. Line infections are so common that they are considered a routine complication.” (pg 27-28) Medical errors are a significant cause of patient injury and death, even in the best hospitals in the world filled with specialized staff. Aviation and commercial flight. In 2010, the Denver Post reported that human error was the primary cause of dozens of commercial aviation safety incidents since 2005. Like medical professionals, commercial pilots are well trained and supported by companies. Human error mistakes in space exploration. In 1999, NASA lost the unmanned spacecraft Mars Climate Orbiter which had been launched to explore Mars. While space exploration is full of unknowns, one critical mistake was later identified. One part of the software involved used metric units while another part used “American units” (e.g. pounds). As a result, the Orbiter made an error and disintegrated in the Mars atmosphere. In addition to slowing scientific progress, the error represented a significant loss of valuable equipment. Fortunately, the checklist is one way to address the challenge of making sure we are using existing knowledge correctly. Whether you are seeking to improve the quality of software or improve safety, the checklist is a high leverage tool. In his book, Gawande reports on a surgery checklist program he launched at several hospitals around the world. I was most impressed by the fact that the checklist significantly improved performance globally, despite major differences in equipment, training and tradition. While I wouldn’t call it a magic bullet, it is one of the easiest to implement improvement mechanisms I have ever seen. Boeing, NASA and other large organizations have entire teams dedicated to creating checklists. Fortunately, you can capture significant improvements using checklists even if you are working on your own. The following six step process is designed to help you create and use your first checklist. Once you become confident with the process, you can develop checklists for other important activities in your life and work (e.g. preparing for an international trip or launching a product). One note of caution before we proceed. Resist the urge to create a complex checklist with dozens of steps. After all, a checklist only produces value if it is used. As with any other skill, it makes sense to walk before you run. Understanding the most significantly causes of failure is the first step in creating a helpful checklist. For this blog post, I will use the example of creating a corporate financial report. Two of the common causes of failure are data source problems and model performance errors. Addressing these mistakes will form the focus of the checklist. With most types of work, there are other people in your organization who either do similar work or who use the results of your work. Ask these people for their ideas on the common causes of failure or what they would suggest checking. I have found that many people are willing to offer some thoughts and observations, especially if they are impacted by your work. Do steps are exactly what they sound like – reminders to do a specific action. In the case of a corporate financial report, you could check the structure and size of the data source files for validity, using previous reports as a baseline. Likewise, you can check data connections in the model to ensure that data is flowing through the model correctly. This step comes from Gawande’s example of a checklist in the operating room. In his example, he created a step on the checklist where everyone introduces them by name and role. In the project management context, “Talk” steps are even more important. The talk steps selected for the checklist are designed to prevent the major causes of failure. In the case of a financial report, one could schedule a short meeting with the stakeholders to review the draft report before it is approved for release. Following the above steps, you finally have the chance to put your checklist into action. Expect that your first checklist will have some gaps. Simply take note of those gaps and continue working through the process. In the example of producing a financial report, a gap might be to validate the currency and foreign exchange factors of the source files. Based on your experience in Step 5, it is time to refine and improve the checklist. Continuous improvement is the name of the game in checklist development. As you improve the quality of your work with checklists, consider sharing your findings with other professionals. How have you used checklists at work or elsewhere to improve the quality and consistency of your results?